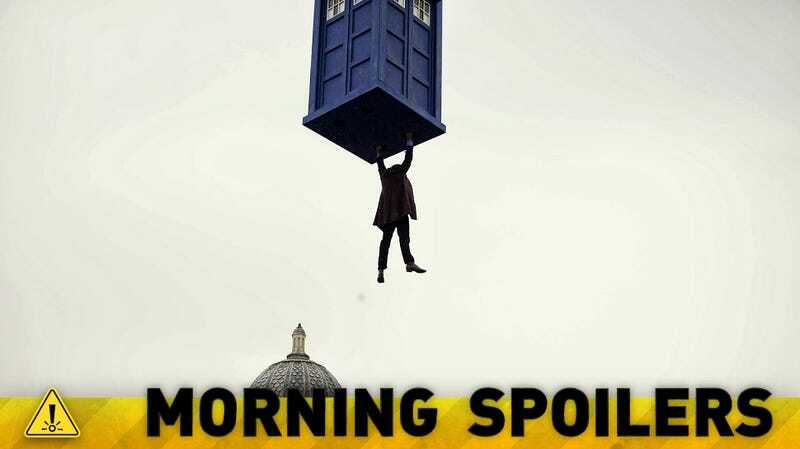 Have all the secrets of Matt Smith's last Doctor Who been revealed? Could Stephen King's The Stand become a movie at last? Stan Lee's working on a movie for Sony, details have emerged about the in-development Agent Carter series, and someone we know well is getting shot by Oliver on Arrow. Plus, there's a rumor CBS is working on two Star Trek series — but what are they about? Spoilers ahead! Some titles give away too much. This [50th anniversary] is a party time, so we're doing things differently. One Doctor at a time is the real rule – 'Who would be on the lunchbox?' is always my question when we talk about having more than one Doctor.
. . . Quite soon, it's going to go back to… 'There is one Doctor and that's who he is' – he's one man with many faces, he's not a committee of people with unusual hair. I'll be going into the office next week and take a peek at it with the guys, 'cause they were talking about... I mean what a perfect series this would be. You've got S.H.I.E.L.D. on now, and this would be like a 1940s S.H.I.E.L.D. It's pretty great stuff. I would love to do it. Dum Dum's one of my favorite characters I've ever played. He's just so much fun. You know he's just another barrel-chested, beer drinking, good guy. And I really like that. I'd have to go gain 20 pounds again. But, hey, what are you gonna do? They actually didn't script the moment with the kiss. It was an intense moment between these two characters who had very strong feelings for each other. They had saved each other's lives at different points in time [and] you never knew quite where it was headed. Underneath it all, we thought something platonic could definitely turn romantic, would the circumstances permit themselves. We didn't write the kiss into the scene, it was something that the actors actually felt in the moment. We had takes where they didn't do it and then they finally went there. Initially we didn't think it was right for the episode and we didn't watch it until finally we opened up the cut for the episode and we finally looked at the episode and went "Whoa." I think there are a couple things that we've been talking about. In the wake of Carter's death, [Reese will wonder] how can Harold have built this machine if it wasn't capable to save their friend in time? I think that becomes an interesting source of tension between our main characters. But the other thing that's clearly evolving is the Machine and [there will be] various entities that are out there who want to control it. [We'll also see] a little bit of history of Harold Finch and his creation of the Machine. We have some really fantastic storylines revolving around the Machine. The BBC's mythical mashup show has been picked up for a second season.